And the winner is... White Gum Valley! The Recycle Right team was absolutely blown away by the amazing things being done at schools in our region, which made judging this competition difficult but also very inspiring. We are very pleased to announce that the winner of our pallet garden is the wonderful White Gum Valley Primary School, who took us on a compelling tour of their school, showing us all the ways they reduce, reuse and recycle and the empty space that will now be the home of the Recycle Right pallet garden wall. Principal Glenn Rondoni announced the win at a recent school assembly, along with the additional exciting news that students at the school had also been successful in winning a $100 Bunnings voucher, which will be put to good use buying plants for the garden. 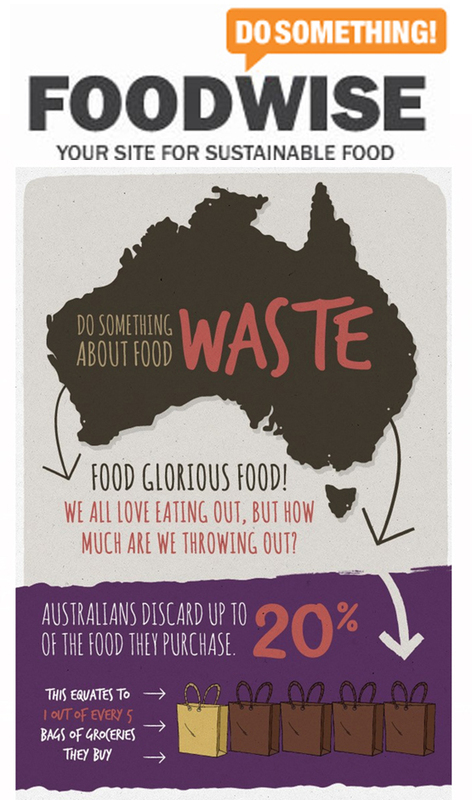 Each year, Australians throw out $8 billion of edible food. That’s equal to 450,000 garbage trucks worth of edible food going to waste! Leftovers account for 27% of all the food that’s wasted in Australian households and DoSomething’s National Leftovers Day aims to change this for the better. National Leftovers Day is about saving money and helping the environment by using our leftovers and reducing the amount of food going into landfill. It gives people practical tips that will help to reduce this figure. Boxing Day is National Leftovers Day. It’s the day of the year when fridges around Australia are bursting with leftovers. Help fight food waste by getting involved! The FREE Recycle Right App has a section to help you love your leftovers. Using leftovers is one of the best ways to save money and prevent waste. These easy recipes will help transform your leftovers into exciting and delicious family favourites. Turn leftover roast chicken into soup or pilaf, or over-ripe bananas into banana bread or muffins. Download it from the App Store or Google Play and get busy in the kitchen! We asked you "what's wrong with this picture?" Unfortunately, we’re still seeing the same mistakes. Remind your friends and family. 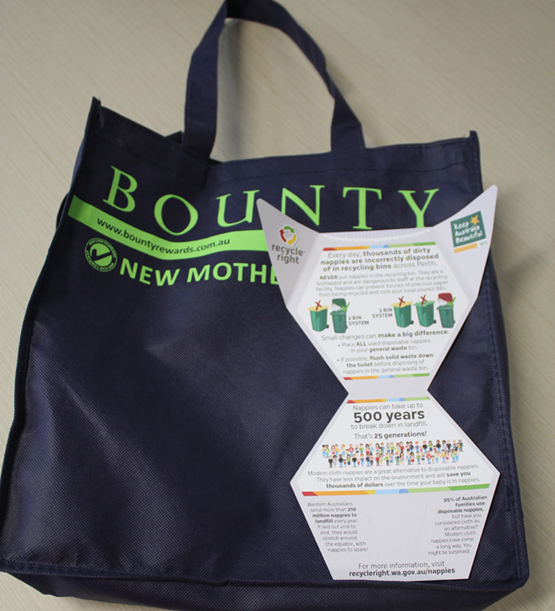 Keep your recycling loose and out of plastic bags. Clothes don’t belong in the recycling bin. Use the Recycle Right app to find your nearest charity store to donate your unwanted clothes. Organic waste, such as leaves, lawn clippings and food, don’t belong in the recycling bin. Set up a compost bin at home or place garden waste in your green lidded bin. Lids off and rinse where possible. Even with the increased exposure and education around waste and recycling, many people still don’t have a understand how their waste is processed and recovered. 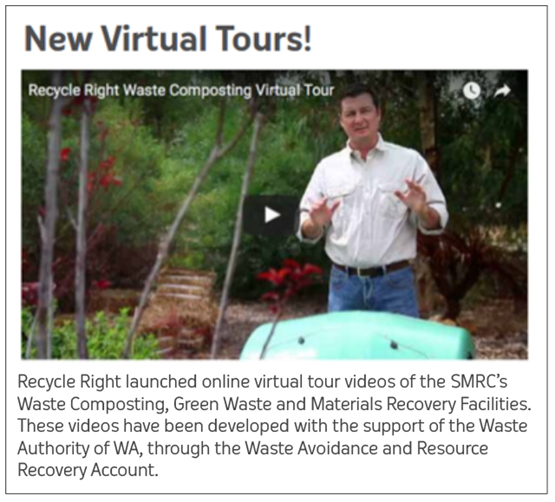 If you haven’t already checked out our virtual tours, you’ll find they are a great way to experience the realities of resource recovery, from the comfort of your home, classroom or office. The virtual tours provide an insight into the processing and recovery of general waste, recycling and green waste and are suitable for people of all ages. If you like what you see, why not forward them on to a family member, friend, neighbour or colleague! 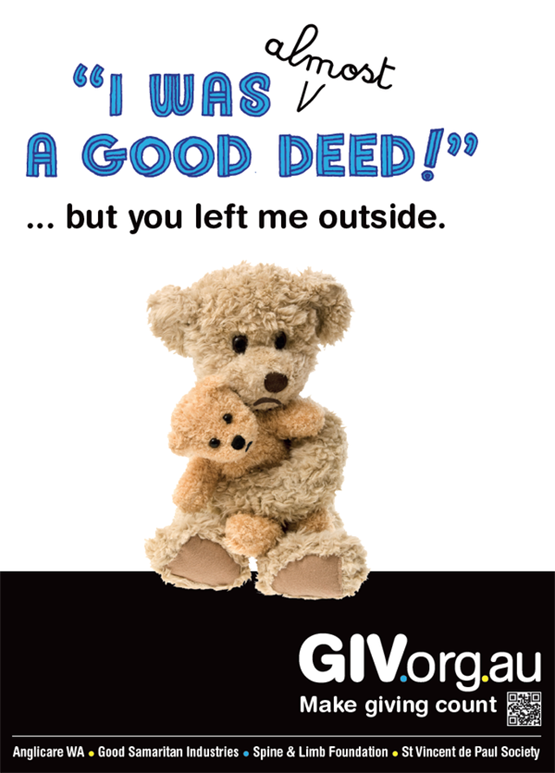 GIV.org.au is a charitable partnership between Anglicare WA, Good Samaritans Industries, Spine and Limb foundation and St Vincent de Paul Society to reduce waste and make every donation count. Each year it costs charities $312,000 to remove items left outside donation stations. Donations left outside a charitable donation station, even if of good quality, will almost certainly be damaged by vandals or weather and have to be removed by charities and disposed of, both at their cost. Goods left outside charitable donation stations are the source of complaints from members of the public, shopping centre strata managers, and council authorities and ultimately result in the removal of bins, which impacts charities in lost revenue from the sale of donations. If something is of such a size that it cannot fit through the donation chute then it can’t be donated through a charity drop box. Some charities offer free home pickups of furniture or other items that are too large for donation through the chutes. To give your things to charity, visit the website and use the tools to find locations and guidelines for donation. You can also find advice on what to do with items that cannot be given to charity. 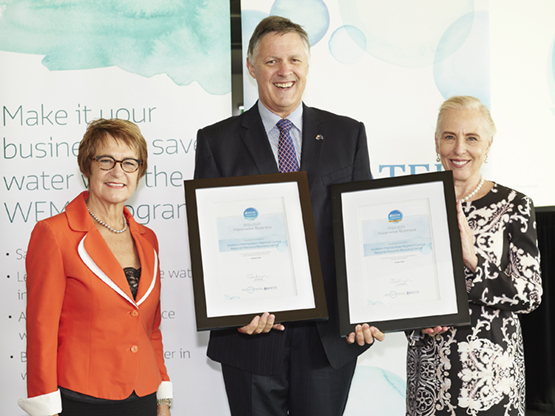 On Tuesday the 19th of April the SMRC was recognised as Waterwise Champions, for achieving improvement in water efficiency at the Regional Resource Recovery Centre in Canning Vale of at least 35 per cent for two consecutive years. At the Water Corporation’s Waterwise Business Forum Awards Ceremony, the SMRC was one of 89 businesses recognised for collectively saving 14 billion litres of water in 2014-15. The SMRC received a Gold Award for achieving 35-50% improvement in water efficiency and a Waterwise Champions Award. ‘As well as water saving measures being integrated into upgrades on site, the staff have implemented other initiatives such as water saving shower heads and have been educated on how to use less water’ SMRC Chair Cr Cameron Schuster said. Water saving initiatives on site included switching from scheme to ground water for the biofilters and installation of a waste water treatment plant. 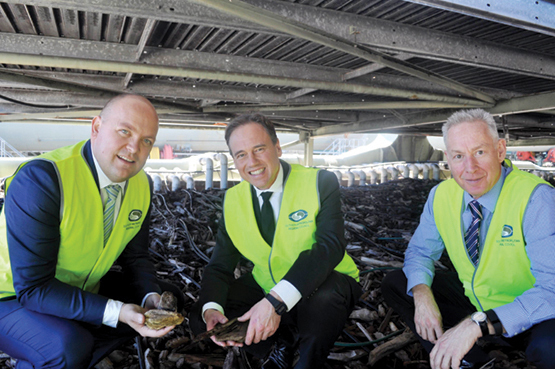 Federal Environment Minister the Hon Greg Hunt visited the Regional Resource Recovery Centre’s Waste Composting Facility in Canning Vale on Wednesday the 11th of May. The Minster was joined by Matt O’Sullivan, candidate for Burt and Senator Linda Reynolds. The SMRC’s Waste Composting Facility has a strong record of carbon emission reduction through the Greenhouse Friendly Program, the Carbon Farming Initiative and most recently, the Emission Reduction Fund. A significant achievement this financial year was successfully receiving a contract above the average price in the Emission Reduction Fund first round auction for Australian Carbon Credits. This recognised the ongoing work of the SMRC and member councils towards reducing greenhouse gas emissions by diverting organic waste from going to landfill. “What they are doing is everything we wanted from the Australian environment policy,” Minister Hunt said. “It reduces 32,000 tonnes of emissions every year, has a contract of over $2 million with the emissions reduction fund and it is cleaning up landfills… that is a powerful trio of things.” Citing its green waste facility and waste composting facilities, Mr Hunt said it was a high standard nationally. “There are some other very good examples of waste recycling, composting and mulching but this is best practice… it would be hard to find anybody who could lay claim to doing it better,” he said. He said he was delighted to witness the process. “I have just seen the largest cooker and oven I have ever imagined and what that means in real terms is that they are producing mulch that is used on farms, reducing the need for water and most significantly, improving the productivity of our farmers,” he said. SMRC’s Regional Resource Recovery Centre commitment to Environment, Quality and Safety was recognised in May 2016 through the re-certification of the Environmental Management System, continued certification of the Occupational Health & Safety Management System and the newly certified Quality Management System. 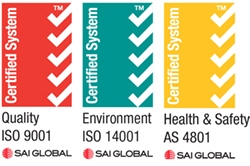 Certified through SAI Global all three certifications reinforce SMRC’s Regional Resource Recovery Centre commitment to system improvement, customer and community satisfaction. This year the questions centred around the disposal of broken glass, electronics, disposable nappies, bottles and jars, non-rinsed items and the disposal of recyclables in plastic bags and returned mixed results. • 4% of resident’s dispose of nappies in the recycling bin, up 2% from last year. Always dispose of nappies in your general waste bin. • 20% of resident’s place broken glass in their weekly rubbish bin, down 3% from 2015 and 12% from 2014. Always place broken glass in your recycling bin. • 35% of resident’s do not remove the lids of bottles and jars either all, or some of the time. Always remove lids from bottles and jars before placing them in your recycling bin. • 38% of residents are utilising local phone or battery collection bins, up 2% from 2015 and 13% from 2014. Always dispose of phones, e-waste and batteries at the appropriate collection point. • 53% of resident’s place non-rinsed items in the recycling bin, meaning people are either not rinsing all of their recyclables or are not sure where to dispose of unrinsed items. Always rinse containers before placing them in your recycling bin. National Science Week is Australia’s annual celebration of science and technology and featured more than 1000 events around Australia, including those delivered by universities, schools, research institutions, libraries, museums and science centres. 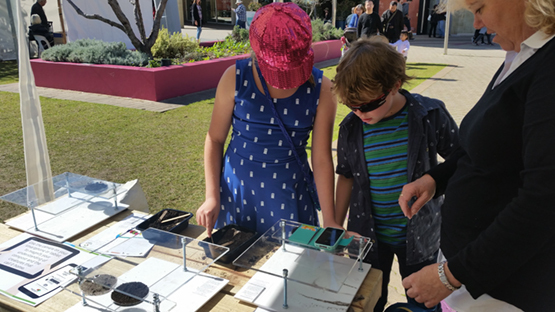 On Saturday 13th and Sunday 14th August, the Recycle Right team debuted ‘Recycle Right’s Wonder filled World of Waste: Clever Composters’ stall at the Perth Science Festival, an event that saw attendance exceeding 25,000 people. I-Scope Stands allow visitors to transform their phone or tablet’s camera into a microscope, letting them explore the differences between different soil types. Many visitors took the opportunity to ask the hard hitting questions about what happens to their waste. 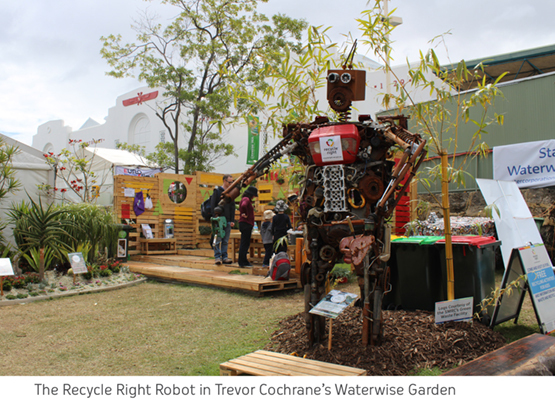 The 2016 Perth Royal Show saw Recycle Right make a return to Trevor Cochrane’s Waterwise Garden from the 24th of September to the 1st of October. This year we were located in an awesome display that featured a vertical pallet garden and decking area, aluminium and plastic bales, furniture and items made from recycled plastic and cans, as well as bench seats and tables made from timber collected at the SMRC’s Green Waste Facility. Recycle Right team members, alongside staff from our member councils and volunteers from the Waste Recycling Education Network (WREN), engaged in a number of different activities, including origami seed pot making, creating fridge magnets out of old milk bottle lids. They also provided and collected information about all things waste and recycling. The mixed weather didn’t scare off visitors and the Waterwise Garden display saw in excess of 247,000 visitors throughout the course of the show. In addition to the display in the Waterwise Garden, the SMRC contributed at the ‘Is plastic fantastic?’ stand, a collaboration with the other metro regional councils to provide collaborative information about sustainability. This year’s Garage Sale Trail, held on the 22nd of October, proved again to be a great success and saw a total of 15,329 garage sales and stalls registered nationwide. 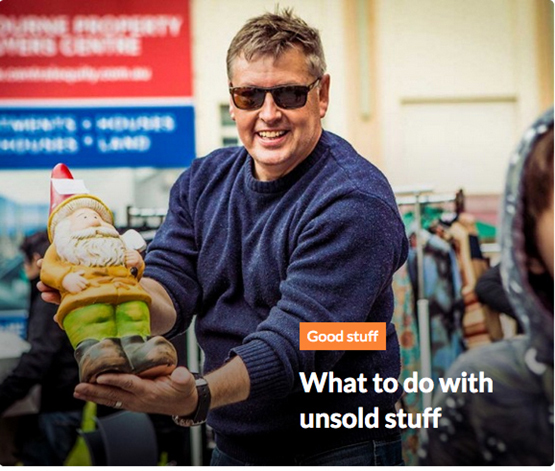 Within the Southern Metropolitan Regional Council there were a massive 679 Garage Sales and stalls, with the weather providing a fantastic day for Australia’s ‘big day of good stuff’. The City of Melville’s efforts were recognised at the Garage Sale Trail Council Awards. With an entire team in attendance at the WA Kick off session, Melville proved they were a force to be reckoned with from the very beginning and have received an Outstanding Achievement Award. Utilising a multi-faceted approach including social media, community group involvement, local newspapers and elected members, Melville succeeded in reaching top of the WA Leaderboard with 223 sales and stalls registrations, congratulations Melville! The Southern Metropolitan Regional Council was also recognised, receiving a special mention at the awards. We’ve already saved the date for next year’s Garage Sale Trail, Saturday 21 October 2017! 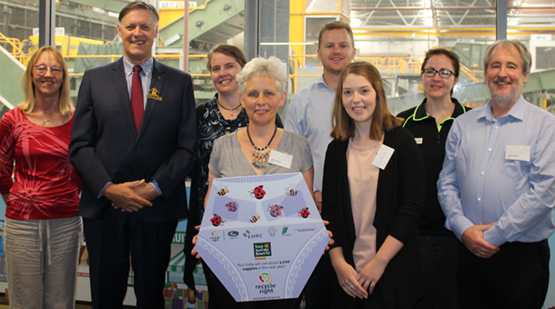 On the 22nd of November, SMRC Chairman Cameron Schuster kicked off a campaign to help educate the public about the correct disposable of nappies through the Bounty Bag program at the Regional Resource Recovery Centre in Canning Vale. The campaign will target 21,000 new parents in the Perth metropolitan area over the next year and is aiming to help reduce the number of disposable nappies ending up in recycling bins and in the litter stream. Funding for the campaign has been made possible thanks to a $10,000 Community Litter Grant from Keep Australia Beautiful, as well as contributions from the other regional councils around Perth. The event was attended by representatives from Keep Australia Beautiful, WALGA, WMRC, EMRC, MRC, SMRC and launched, what is hoped to be, an effective campaign. 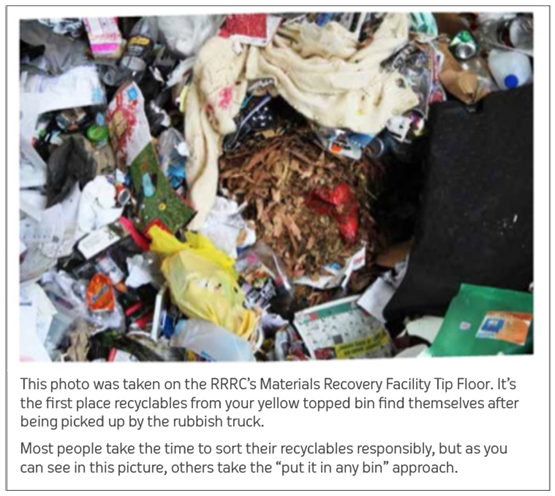 With school holidays in full swing, the coming months are a fantastic opportunity to come out to the Regional Resource Recovery Centre to find out what happens to your waste. 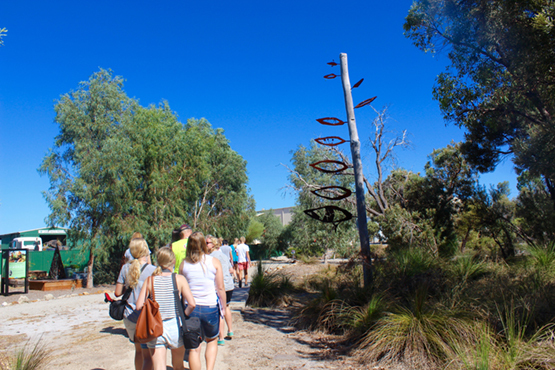 If you’d like to visit our facility in Canning Vale, we have a number of Community Tours available over the next two months. To provide feedback or request an accessible version of this document please contact us. Copyright © 2016 Southern Metropolitan Regional Council, All rights reserved.